First off, just let me say - if you don't want to get hooked on another series, stop reading right here... 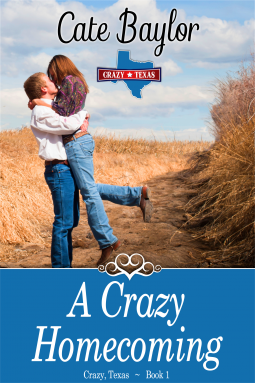 I am already anticipating Crazy, Texas - Book 2 and it's not due out until December! A Crazy Homecoming (Crazy, Texas) is a book I found as an e-ARC on Netgalley.com and I read in one session because I couldn't put it down! Getting fired over a workplace meltdown was bad enough, but getting dumped at the exact same time by her boyfriend-slash-boss was the ultimate humiliation. With no real friends in L.A. and perennially absent parents, Daphne Simms has no one to turn to. To heal her heart, she runs to the only true home she’s ever known—her grandmother’s rural Texas ranch, called Crazy. She knows ranch folks will be a far cry from those she's known in L.A., but she certainly doesn’t expect to be greeted by a cranky cowboy shoving a shotgun in her face. Mick Williams has lived and worked on Crazy for twenty years. Though he’s utterly devoted to Daphne’s grandmother, he’ll be damned if he’s gonna let a city slicker like Daphne sashay in and disrupt his nice, quiet life. When the future of Crazy is threatened, Mick and Daphne must join forces to keep the ranch afloat, but the heat of their attraction makes working together more complicated than either of them imagines. When their physical and emotional connection deepens, Mick tries to turn away from the woman he’s convinced he doesn’t deserve, so Daphne has to pull out all the stops to convince him that the heart of Crazy is big enough for the both of them. As I said at the opening, this was a really quick read for me - I was engrossed in the story almost from the first chapter and I felt like I became friends with the characters, both main and supporting as I continued to read! I love that the author was able to weave humor, sexual tension, honest emotion and truly three dimensional characters into this story and offer both a compelling tale and a great back-story! I appreciated the pace and tension in this book and the only complaint I have is that the next book in the series, A Crazy Reunion isn't due out for several months! If you like Western Romance or just Contemporary Romance, and are looking for a flowing read with good characters and more to come, then you should pick up A Crazy Homecoming (Crazy, Texas) which is available in paperback and ebook options. Cate Baylor has been a technical communicator for over fifteen years. When she's not writing, she suffers from hobby addiction, which includes (but is not limited to!) reading, jewelry making, crochet, knitting, scrapbooking, cross stitching, and home DIY. She lives in Houston with her geeky husband, three neurotic cats, and precocious Yellow Lab named Tex. She comes from a long line of Texan famers who are likely rolling over in their graves knowing she’d much rather stay blissfully air-conditioned than suffer outside in the Texas heat. She's a die-hard Texans fan but hasn't decided whether she's willing to embrace the Astros as an American League team.